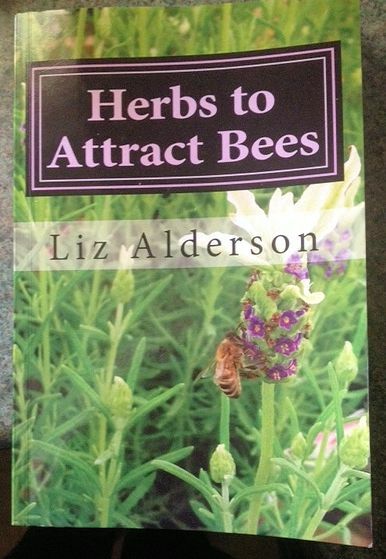 I have been finishing my book 'Herbs to Attract Bees' - it has been two and a half years since I first started putting it together, and bees have become very high profile in that time. I am really excited about it - I have been 'ready-aim, ready-aim' messing about tweaking a word or two here and there, but I do feel it is now the very best it can be. It has an introduction, explaining about the problems bees are facing - why we're partially to blame and how we can make a difference. Then the herbs which are especially attractive to bees, giving growing tips, culinary, medicinal and cosmetic uses for each herb. The next sections deal, step by step, with making herbal remedies, cosmetics and preserving herbs and how to avoid and cope with bee stings. There are nearly 60 full color photographs illustrating the book. One of the parts that took a LOT of research, deals with other plants and trees that provide food for bees - there are over 150 entries divided into seasons and categories, which, if you have a larger plot, you will find really helpful. I've finished with a Gardening Glossary, explaining all the terminology in the book, expanding on the techniques so that nothing is unexplained (I hope!) things like taking cuttings, dividing, earthing up - the foreign language that experienced gardeners talk amongst themselves - you will now know what they are talking about! It's available as full color paperback or Kindle version and has already attracted some excellent reviews. Click on the photo below and it will take you to the page which gives a fuller explanation. OK - so that's this month's newsletter - hope to see you next month. It’s lovely to hear from you and I thank you all for your emails – it never ceases to amaze me that people are out there on the internet and want to talk to me! Join our Facebook page if you ‘do’ Facebook – it’s a way of keeping in touch instantly and there are over 4300 members in our little community. So that's it for now - if you have any questions, then please contact me.